So you have heard about our little island paradise and were wondering how to get to Koh Tao? We are a small 21 square kilometer island situated in the middle of the Gulf of Thailand. A remote island paradise can sometimes be a little hard to reach. Koh Tao however is serviced by ferries from the coastal towns of Surat Thani and Chumpon as well as the islands of Koh Samui and Koh Phangan. Once you are at one of these destinations it is quite easy to reach us by boat. If you have just landed in Thailand’s capital, don’t worry, we will also explain how to get from Bangkok to Koh Tao in a few different ways. How to Get to Koh Tao from Koh Samui? 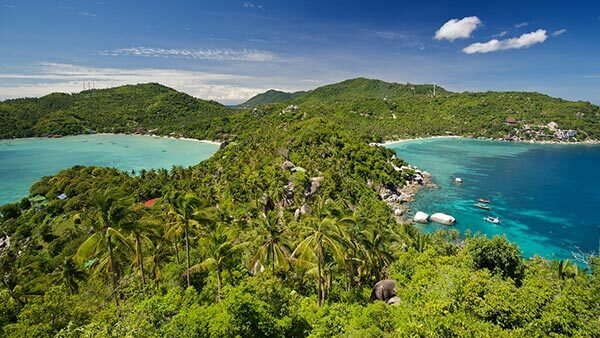 The most expensive yet also the most convenient option to get to Koh Tao is to fly to Koh Samui first. From there you catch the Seatran Discovery ferry that leaves at either 1pm or 4:30pm from the Bangrak pier which is close to the airport on Koh Samui. You can book the ferry ticket when you arrive at the airport and they have a minivan transport service. Koh Samui is an international airport serviced by Bangkok Airways. If you want to catch the Lomprayah High Speed Catamaran ferry, you need to transfer to another pier on Koh Samui. Either Pralarn or Nathon, depending on your departure time. Option 1: Catch a flight with Nok Air domestic airline from Bangkok to either Surat Thani or Chumphon. From either airport there is a shuttle provided by the ferry companies, either Lomprayah or Seatran to take you to the respective pier. From their you catch the ferry to Koh Tao. 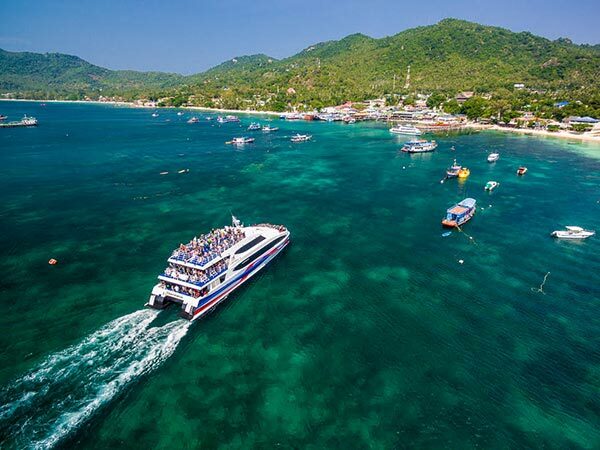 Option 2: You can catch a bus directly from Khao San road to Chumphon with a connecting ferry service to Koh Tao. Lomprayah offers this service and it is a combined ticket which includes both bus and ferry. Option 3: You can take the overnight train from Bangkok to Chumphon and catch the early morning ferry straight to Koh Tao. Train tickets can by pre-purchased on Seat 61. Option 1: Take a domestic flight with Nok Air to Chumphon or Surat Thani and catch the next ferry to Koh Tao. Option 2: Take a minivan to Chumphon or Surat Thani and catch the next ferry to Koh Tao. Boat journey times vary due to the different boats used by the various ferry companies. Travel times are also affected by weather and some services might be cancelled in extreme weather conditions. All ferries dock at the main pier in Mae Haad, Koh Tao. It is a short 5 minute taxi ride to our dive resort on Sairee Beach. When leaving Koh Tao, transport can be booked to get off the island at the Sairee Cottage reception. During busy periods such as ‘Full Moon’, we recommend that you purchase a ticket one or two days in advance. If you feel that this page did not provide enough information about how to get to Koh Tao, please don’t hesitate to shoot us a message. We are happy to help! We look forward to welcoming you to the Sairee Cottage Diving family!